All transactions are safe and secure with a reliable history in online purchasing behind each of our associates. 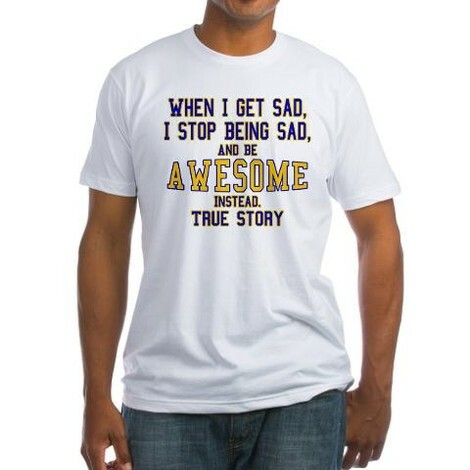 Buy the When I get sad, I stop being sad, and be awesome instead. True story t-shirt to own How I Met Your Mother clothing and merchandise. The fronts of these How I Met Your Mother t-shirts feature the Barneyism, "When I get sad, I stop being sad, and be awesome instead. True story". Barney Stinson tells his friends Ted and Robin this invaluable piece of wisdom when they are talking about Marshall, who is distraught over his break-up with Lily. Fans of the TV show often repeat this popular Barney quote from How I Met Your Mother. Pair it with one of the Suit Up t-shirt styles. In addition to the When I get sad, I stop being sad, and be awesome instead. True story tee above, browse the How I Met Your Mother Clothing Gallery for more apparel like men's and women's clothes, kids shirts or hoodies.